This wasn't supposed to be my next project, but I just couldn't get it out of my head! Funny, considering it's a top pattern that doesn't even come in my size. I had lots of success sizing the Hemlock up to fit me though, and wanted to share. Hemlock Tee by Grainline Studio, free if you sign up for the Grainline newsletter. 66% Rayon from Bamboo / 28% Cotton / 6% Spandex with 3/8 inch stripes in natural/black. 1.5 meters. I bought it from Water Tower Textiles - here. It was 60 inches wide, 200 gsm weight, and has 4 way stretch. It feels like a nice high quality knit once sewn up. Definitely substantial. This pattern comes in only one size with a finished bust measurement of 44.5 inches. The pattern photo has the shirt shown on a 32 inch bust. I really liked the over-sized fit of the tee, so I figured out that the top was 1.39 times larger than the wearer's bust and went from there. I decided to round to 61 inches since there is so much wearing ease in the top and it was an easier number to work with. The difference between the 61 inches I wanted in the top and the 44.5 inches the top was drafted to is 16.5 inches, which I decided to round to 16 inches total. I would add half the width to the front (8 inches) and half the width to the back (8 inches). The thing that almost tripped me up is that since the front and back pieces are cut on the fold, you only actually need to add a quarter of the total width you plan to add to the actual pattern pieces. In this case, 4 inches. I printed and assembled my pattern, and then drew a line about mid way between the shoulder tip and the neck, straight down to the bottom of the shirt (the yellow line in my 'illustration'). I sliced that line top to bottom and moved the two pieces 4 inches apart from each other (the blue line). I just made sure to keep the lengthen/shorten lines at the same level to keep things aligned properly. I taped the two pieces to my cutting mat and grabbed some medical exam paper I use for tracing patterns, placed it on top of my spread apart pattern and traced out the sides and bottom of the piece in it's new position. 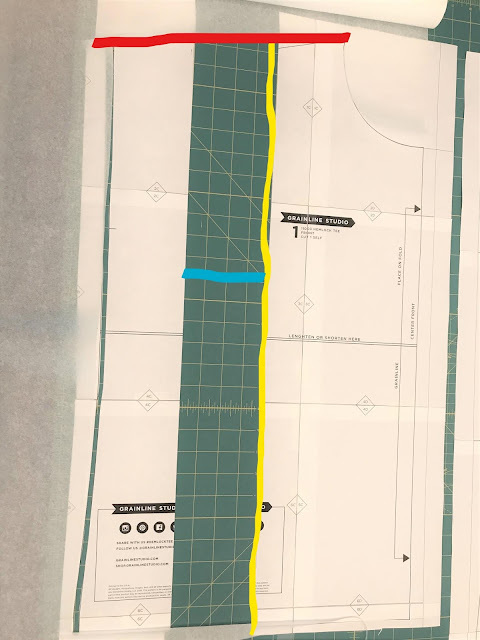 You'll see that the shoulder isn't a straight line anymore, so I just laid my ruler across and connected from the neck edge to the tip of the shoulder in a straight line (the red line on my picture). I could have just put a strip of paper and taped it in the middle area where you can see my cutting mat, but I like to re-trace whenever possible to give myself a clean pattern that's easy to put away and easy to take out again. I repeated this same process with the back piece, and got cutting! Since this process didn't alter the sleeve attachment or the neckline, I left the sleeves and the neckband alone and used them as originally drafted. Based on my fabric, and in hindsight, I wish I had added 3/8 inch or 1/2 inch to the neckband length. It's just barely causing some little puckers/gathering below the neckband. A good pressing didn't help, but I'm hoping as I wear it it'll relax a little bit. The sleeves are quite roomy as drafted, and this silhouette looks really good with the super loose body and more fitted sleeves, so I decided not to fiddle with them. To improve fit for myself, I might narrow down the forearm and wrist of the sleeve and I am also considering adding another 3/4 inch to the sleeve length so I can put on a slightly less narrow hem next time. I think I'll likely draft a short and a 3/4 inch sleeve piece before I put the pattern away, so it's all ready to go when fancy strikes. When I used the serger to join the shoulder seams, I serged on 1/4 clear elastic on those seams too. This will keep the shoulders from sagging, and ending up further down my arm than intended. I ended up fighting a bit with my serger at the beginning of this project (the first fight we've ever had! ), and stretched the elastic a little as I sewed. Normally, I would have pulled out the stitches and re-applied new elastic, but this was the last length of 1/4 inch clear elastic I had, so I kept going. I've since ordered a 150 yard spool of clear 1/4 inch elastic from Cleaner's Supply, since it feels like I'm constantly running out, and the closest local source is 30 minutes away. I think I've gone through about 15 yards in the last year, so the 150 yards will last me about 10 years if I keep going like I have. I got my Janome 1000CPX cover stitch machine last Christmas, and have really struggled with it. Tons of skipped stitches no matter what and just not a smooth ride. Every sleeve or neckband or hem took 3, 4, 5 tries, and even still sometimes I could never get it right. It just didn't seem to be running smoothly. I've had it in the cupboard for a few months, and I pulled it out yesterday and decided to open it up and check the grease and oil. Even thought it was a new machine, I felt like I would feel like a bit of an idiot if I didn't at least check that out before swearing it off again. I pulled it out, opened the cover, oiled the oil-able parts, greased the grease-able parts, and set out for some test cover stitching. It was like a completely different machine! So glad I did this. If you have a Janome 1000CPX that's giving you problems, even if it's brand new, you might want to take it in for service. I wish I had in January! Anyway, I was able to hem the sleeves and the bottom hem of my shirt. ON. THE. FIRST. TRY. I used the settings from this thread on Pattern Review, which works fine for t-shirts. Do you have a favorite free tee sewing pattern? Have you needed to make similar changes to a one size pattern?